The main problem one encounters with recommending specific diet foods for TMAU is that not all TMAU+ persons do well with the TMAU protocol, implying that there might be (probably are) other concerns, as noted in the powerpoint presentation by Dr. Colin HW, MEBO’s Scientific Director in UK, Dimethylsulfidemia, section on TMAU. Some sufferers speculate that their symptoms are triggered because they have adverse reactions to sulfides, dairy products, sweets, carbs, in addition to, or instead of choline. Unfortunately, if we took into account what every single sufferer thinks triggers their respective odor symptoms, the diet would list one word only – WATER, and a water alone will not sustain life for very long. Therefore, the diet discussed in this post is strictly for TMA produced body/breath odor, and is based on the published TMAU protocol discussed and recommended in the article, Trimethylaminuria, written by Drs. Ian Phillips and Elizabeth Shephard. It seems that even some experts go modifying some of their opinions through time. Also, as we know, we have plenty of expert sources that tell us what NOT to eat, but very few that tell us what WE CAN eat. Lipid (fat) transport metabolism. "Without adequate phosphatidylcholine, fat and cholesterol accumulate in the liver." "Men and women fed intravenously (IV) with solutions that contained adequate methionine and folate but lacked choline have developed a condition called "fatty liver" and signs of liver damage that resolved when choline was provided." Choline may be oxidized in the body to form a metabolite called betaine. Betaine is a source of methyl (CH3) groups required for methylation reactions. Methyl groups from betaine may be used to convert homocysteine to methionine. Elevated levels of homocysteine in the blood have been associated with increased risk of cardiovascular diseases (5). The TMAU low-choline diet is very much a personalized development based on individual needs. The important thing is to not think that a low choline diet means to eliminate choline all together. IMPORTANT NOTE: Children and pregnant mothers should not decrease their choline consumption, and should consult with their physicians before modifying their diets. Of course, this AI may not be (most probably is not) tolerated by some TMAU+ adult individuals without triggering odor symptoms. Nonetheless, it is a goal to reach for, and each sufferer must stop short when symptoms are triggered. The TMAU low-choline diet is very much a personalized development based on individual needs. The important thing is to not think that a low choline diet means to eliminate choline all together, this is not a healthy choice. 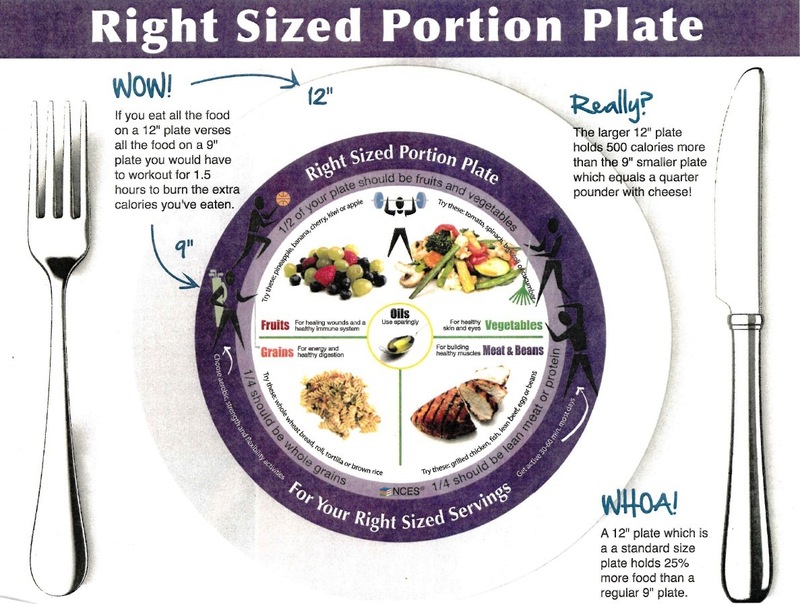 The pyramid food groups previously used as a guideline for a well-balanced diet has been replaced by the Right Sized Portion Plate. Please note that the food noted on the image are for persons who do not have a malodor condition, but the intent here is to show the food groups and portions of each that sufferers should strive to consume per meal, and note that fruits and vegetables should fill half of your plate. 1 oz of poultry is usually the best choice. Only fresh water fish, such as Tilapia, is lower in choline content. Consult with the USDA Database for the Choline Content of Common Foods, Release Two, chart starts on page 12, see Total Cho (total choline) column. To find an item in the chart, do Ctrl+F and type in the name of the food. If not found in the chart, type in the type of food, i.e., vegetable, fruit, etc. You can also find more information on nutrients provided by the USDA with this tool. A low choline diet is innately a low protein diet by default. 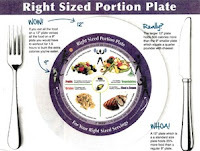 Nonetheless, if one is not a vegetarian, chicken and turkey should fill this quarter of the plate as opposed to red meats. See some tasty protein options below. *Nuts are high in choline, but some people tolerate one teaspoon, or maybe even a tablespoon in some cases, of peanut butter a day (would make a nice peanut butter and jelly/jam sandwich). Spaghetti with ground turkey and small amount of beef (optional) in lots of tomato sauce. Adds little beef flavor if beef is used, but the amount of beef per serving would be small if cooked in a large pot. Breaded chicken breasts, dipping the thin cut chicken breast or chicken tenders in egg whites and bread crumbs or flour and fried in Canola oil. Can serve with pasta. Chicken fricassee with chopped potatoes and/or rice(white or with yellow coloring using a dash of Achote or Annato (bijol in Spanish). Can substitute chicken breast or chicken tenders for ground turkey or ground chicken. Chop potatoes into small cubes. Saute small amount of green and red peppers strips with very small amount of onion. Season chicken tenders cubed with lemon pepper and salt and cook until almost done. Add cubed potatoes until tender. Add 2 TB of tomato paste with 1/2 cup (or more as needed) of water to make sauce (not too much), or 1 to 2 can(s) of tomato sauce. If tolerated, 1/4 cup or less of red wine for flavor(optional). Cook long enough for sulfur in onion and wine to evaporate, and it's done. Cook rice on the side, can add yellow coloring to the rice (optional). Serve rice with sauteed chicken & potatoes. Chicken tempura. See recipe online. Tacos with the chicken fricassee with chopped up tomatoes and lettuce. Avoid hot (spicy) sauce because it has sulfurs. Grains and High fiber foods, i.e., breads, cereals, pastas, : 1 slice of bread, 1 cup of breakfast cereal, or 1/2 cup of cooked rice, cereal, or pasta is considered a 1 oz equivalent from the grains group. Although high fiber foods are recommended for gastrointestinal health, we do need to keep in mind that whole grain barley or rye and cooked brown rice are richer in choline, but if you limit most of your choline intake to these foods, then you might be able to have some of these once in a while, or even daily. So, if you have IBS and need to eat more fiber, you do need to observe your odor symptoms while adding high fiber - less processed grains, while attempting to consume as much fiber in your diet as possible. Again, not every sufferer's FMO3 enzymes function the same; and even in one individual, the enzyme function may fluctuate depending on hormonal changes, lifestyle, stress, etc. Dairy: Milk as tolerated. 1 cup of yogurt. Non-odorous cheeses, such as crumbly white cheeses like Greek Feta are best, depending on individual reactions. Some people have learned to live without dairy foods, and others love their cheese on bread, and milk or cream in their coffee. We see on choline food content charts that milk and coffee are higher in choline content. Yet, there are alot of people who feel deprived without them, and usually succumb to the temptation to consume them. Some sufferers are pleasantly surprised to see that they can have one cup a day, maybe for breakfast? Others are not as lucky. Again, this diet is individualized according to personal symptoms. Each person needs to test his or her malodor "threshhold" as much as possible to be able to eat a healthy and satisfying diet. If one is not satisfied with the diet, one will inevitably break it, and usually break it badly. The aim is to set a lifestyle of successful malodor management and a well balanced diet, as much as possible. Vegetable tempura with carrots, squash, and zuccini. See recipe. Fruits: pineapple, strawberries, apples, bananas, blackberries, blueberries, cranberries, guava, kiwi, lime juice, orange, peaches, pears - preferably all raw; can be added to vegetable juicer with celery and carrots. However, juices have less fiber than the raw or slightly cooked vegetables and fruits. The NIH recommended Trimethylaminuria Management Protocol. Egg yolk or whole egg. (OK to eat egg whites, but keep in mind contains sulfur, which might not be a problem for some). would be good to see examples of daily meals . I've seen many complain of getting under 2500 calories on diet . I know it would be expensive in most cases, but the ideal thing would be for individual sufferers to consult with a dietitian. I know there are sufferers who either have symptoms much more readily with a great deal of foods, and thus they eat less than 2500 calories, and there are other sufferers who select foods from the USDA Database list noted in this post that have caused them to put on some pounds, like lots of potatoes, pastas, and rice. I agree that it is challenging to try to eat a low choline, but also a healthy diet. To be honest, I don't think it's really possible, and that's where I think the 9 inch plate concept is helpful. I have trouble smelling fishy if I eat fish,so even though I love fish I have stopped eating it. I also have trouble with other bad odors and have given up all things containing gluten and foods high in sulfur, although I am going to try green beans in limited quantities. I find that drinking coffee at all is very bad for causing a bad vaginal area odor. this is where most of the odor issues come from and sweaty crotch area. 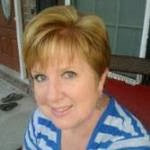 I think it helps to be a normal weight as excess weight will make you sweat more and therefore have more odor issues. I ate a large double cheeseburger one evening and the next morning my crotch area was very sweaty and definitely smelled fishy. I am sure I have some degree of this condition. It makes sense to not eat the foods high in choline, sulfur or gluten. I really think gluten and yeast and sugar make the condition worse. also it seems very helpful to have really good daily bowel movements as this gets all that rotting food out of the gut so the odorous stuff can't get into your system. Potatoes should be avoided if you have TMAU. High choline content, as well. I was surprised you recommended it. Perhaps I’m missing something here. 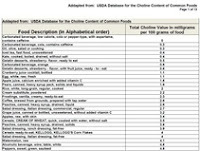 According to the USDA Database for Choline Content of Common Foods, http://www.nal.usda.gov/fnic/foodcomp/Data/Choline/Choln02.pdf, on page 23, they have listed nine different descriptions of potatoes, ranging from 11.0 to 24.0 mg of choline moiety/100 g of food. These descriptions include French fries, frozen, home prepared, mashed , red, flesh and skin, baked, etc. I think that people forget that choline is an essential nutrient, and that even those with TMAU have some FMO3 function, as is noted in their TMAU test. I haven't heard of anyone have zero (0) level of TMAO. It is unrealistic and unhealthy to completely eliminate choline from one’s diet. Unrealistic in the sense that your mind will make you crave choline rich foods if you deprive yourself completely from it, and thus you will be more likely to binge on it one day. It is healthier to consume low levels of choline, and then TO do cardiovascular exercise to help your body’s cleansing organs remove TMA from your body, IF low levels of choline produce odor, which it probably doesn't. There is a very good chance that if you are on a low choline diet and follow the protocol, that either your enzyme would be extremely deficient, or that you have other causes of odor as well. I doubt very much that low amounts of potatoes will produce intense odor, even in TMAU positive patients, based on the choline content of this food. If it does in your case, perhaps you might want to look at other possibilities, such as having other types of odor conditions, or perhaps there are other foods you are eating to be the culprit, while you blame it on potatoes. you will see on column "Total Cho" (total choline) that the choline content of the juices and fruits listed is relatively low. Also, keep in mind that the Total Cho noted is per 100g of food. Have your doctor done a glucose tolerance test for you? Persons with diabetes have odor as their sugar levels vary. I would consult with your doctor if this is not your case. I suffer from bad breath, body odour, smelly discharge, gas, basically anything that my body can emit, smells terrible, I cant eat anything without passing gas. I floss and is smells like I've flossed the arse-crack of a dead rat. My relationships break up because the pungent fishy smell down there is just unbearable. Right so, I do not know what is wrong with me - I am mortified, hopeless, feeling horrid, depressed, exhausted and don't want to die alone. I am a normal mid thirties woman with a great career, fit and healthy, wonderful friends and family and very aware of personal hygene. Systemic Candida VS TMAU ??? The diets for each are quite different. Is there a CLEAR test for each to see what is causing this bacterial war!!?? TMAU is a gas - take Gas Relief pill after each meals. TMAU thrives in acid - take an acid reducer after each meals. pay attention on the dose instructions for drugs. Is there any vegetable that can be substitute for meat and animal products and that it can be good for tmau as well? Is there anz food that can be substitute for meat and animal products and that is good for tmau as well? Try eliminating sugar, carbs and stimulants such as coffee from your diet. Avoid dairy milk, try Hemp milk instead. Detox and massage your liver area by skin brushing, check your mineral levels are not low take magnesium supplements (consult with your doctor first) and drink at least 2 litres of water per day. I think i have symptoms of TMAU but alongwith that i have also lactose and fructose intolerance which also eliminates milk and many fruits from the diet.I like to walk on hilly areas so i fell much tired after that, blury vision at night.my eyesight is perfect but i fell something floating in air. "Is there a CLEAR test for each to see what is causing this bacterial war!!??" Id really like to know this as well. I'm also in my early 30s. Female with really bad bo issues. Not sure what its from but just need to get rid of it. It effects every aspect of my life. Very isolated. Hard to hold jobs. Terrible. Embarrassing. Depressing. I'm sorry you're going through this hardship due to your condition. There are a few things you can do if you haven't done so yet, such as to try to get one or more diagnoses in case you have more than one cause of odor. People with this condition seem so misinformed. If you actually have tmau, eatting something does not produce any oder until it reaches the intestines and even then the intestines are also occupied with 2-3 other meals so to think one ingredient like aspartame is your problem is an unreasonable assumption especially when diet cola is deemed one of the lowest choline content out there. Also some of this blogs information is off because coffee as well as milk have low/very low choline. Eat egg whites for protein and go wild with fruits and carbs(always checking their choline content on the gov database) and these things are doable. Sure if you make excuses and dont take steps to educate yourself this can feel like being doomed. Do some research and stop perpetuating your own misfortune. Only once you are smell free and people are not having reactions can you start reintroducing food groups to test your individual tolerances. You cant half way follow this diet and assume youll be able to figure out what foods are the problem from there. 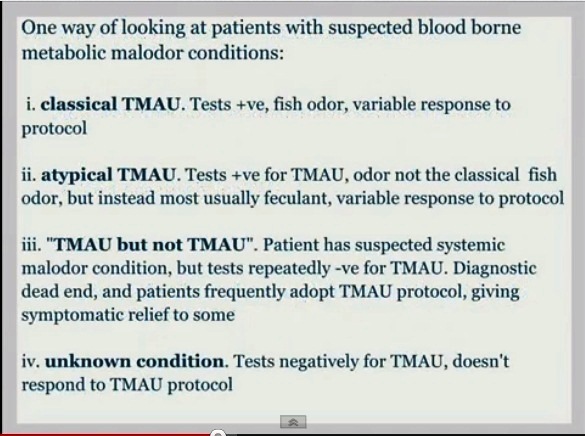 If you go to a doctor, they probably wont be aware of the specifics of TMAU so go to them with the information about TMAU from a reputable website and ask them to arrange a test or to refer you to a specialist. Personally I have done a combination of things to reduce TMAU. 1. Taking charcoal tablets after meals 2. Cutting trigger foods, as soon as I realised I had TMAU I cut out eggs, fish, legumes, beans etc, after I while I realised that dairy products were a big problem so I have now cut out all yoghurt and most milk. 3. Eating tactics - Work is the biggest problem because it means going at least 8 hours without a chance to wash therefore I avoid eating before work and avoid choline at work but am more relaxed in the evenings - also stress definitely increases issues. Good Luck! Anyone knows what source of protein to eat that is low in choline? Fiber is also another problem. Since I cut wheat bread I don't get enough fiber, which should be 28g minimum. Regarding the TMAU urine test: is that something my doctor will do, or do I go somewhere else for the test? Can you be specific? I am in California. For those that need fiber, I'd recommend psyllium husk. For the odor, try chlorophyll along with activated charcoal (recommend dosage on labels). Also use a soap with a pH between 5.5 and 6.5. Dove is an example. Take vitamin B2 as a supplement with meals. If you believe you're also dealing with intestinal candida overgrowth, try taking virgin coconut oil for at least two to four weeks. I used 2 tablespoons morning and night. During that period you'll also want to adhere to a strict candida diet. Focus less on TMAU diets until you get your candida under control. Then you can start incorporating certain fruits back into your diet and adhere to a TMAU diet instead, avoiding meat, soy, legumes, nuts, dairy, etc. and eating a lot of fruits and vegetables. Know that you're going to have to eat some foods containing choline. Your body needs it and its unreasonable to expect yourself to avoid it completely. The most important part of this is your health. Both physical and mental. Make sure you see a therapist if you're suffering from anxiety or depression. Make sure you're seeing a gastroenterologist if you're having digestive issues. If you have the means, loop in a dietician as well. It may seem impossible to live a happy life with this condition but it truly is achievable with the right approach and support. Know that you're not alone and there are people that can help you with this battle. This condition has not been well known or studied. In time, there could even be a cure. TMAU urine and DNA testing. Hospital where TMAU was first documented in 1970. The MEBO test is only $150 plus round trip shipping, and no doctor's orders are needed because it is a research lab. However, then your insurance will not cover it. The MEBO test checks for both, Primary and Secondary TMAU. If you are interested in doing the MEBO urine test, please fill out the Requisition Form. In both cases, the test samples are sent via air currier. I am sorry that you have hit a dead end in your pursuit of controlling your symptoms to be able to work and have a social life. 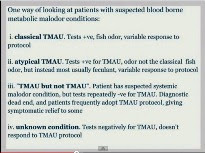 I know that it is particularly difficult in countries where TMAU is unheard of by all medical professionals. What some sufferers who have volunteered dedicated themselves to raising awareness in the medical field using the MEBO Banner have done is to contact the College of Medicine in their respective countries with articles written by professionals on the topic. 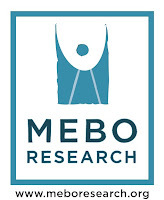 If you are interested in doing this, please contact me at maria.delatorre@meboresearch.org. We have copies of this information in English, Spanish, and Portuguese, and most physicians in the College of Medicine understand one of these languages. I am not sure if you have seen this post from another site by Hopefulbbbo. It is a regimen she follows. Says there is no odor. I tried it and my odor was significantly reduced. I have been doing this now about 5 days and as long as I do the regimen I am odor free with one shower a day and my limited diet, mostly vegan. Still looking for something to sub for beans. I do eat some limited dairy with no odor. When I first started, I didnt have the maca but still seemed little to no odor. Also, after 2 days I added kambucha tea bags by Yogi. seems to be working for me. check out the link. the post is about two/three or four down. Hope it works for you. I have self diagnosed and pretty sure I have TMAU, but would like to get testing done. I have the links but does anyone know if I need to come off the supplements for testing to be accurate? I take activated charcoal and copper chlorophyll internal deodorant. Yes it would be best to stop the supplements, so you don't get a false lower result. The Mount Sinai Division of Medical Genetics (think thats the name but google it) in NYC does TMAU testing.